The rich spice of cinnamon and the sweet tone of sugar compose one of my nearest and dearest comfort flavors. As far back as I can remember, cinnamon and sugar have been a sweet force in my life. The flavors complement each other so well, becoming the Sonny and Cher or Simon and Garfunkel of the culinary world. Growing up, my babysitter would feed me cinnamon sugar toast on cold winter afternoons, after I had trudged home from school in the snow. The hot toast with a layer of melted butter and the spicy crunch of cinnamon sugar warmed my insides and brought the life back into my cheeks. My mother makes a spectacular side dish out of white rice and cinnamon. A cross between sweet rice pudding and savory white rice, it is my favorite pairing to a grilled chicken breast. Nevertheless, the rice is creamy and just ever so sweet, with a thick sprinkling of cinnamon on top. Someday, I will be certain to share this treat with you, too. Yet, cinnamon and sugar have found more subtle ways to pervade my life. My grandmother would coat her leftover pie crust pieces with cinnamon and sugar to make sweet, flaky cookies while we waited for the pie to bake. My mother grew up sprinkling cinnamon and sugar atop her pancakes, using a swirl of cream instead of maple syrup. I adore a light dusting of cinnamon and sugar on top of my morning oatmeal, making me feel as if I'm being decadent while enjoying a healthy meal. That may be what I love most about cinnamon sugar—it's a sweet, simple way to bring decadence into everyday life. These Cinnamon Sugar Muffins have a very unique taste and texture. It's almost as if a muffin and a doughnut got a little too cozy in the oven and popped out a batch of these muffins. Made with a little whole wheat flour, it's fun to pretend these are healthy (as long as you ignore the fact that the muffins are dipped in melted butter). These are lovely for both breakfast and a snack (and sometimes for both of these moments in the same day). With my love for cinnamon sugar, these muffins were bound to happen sooner or later. The same, I think, can be said for this cake. 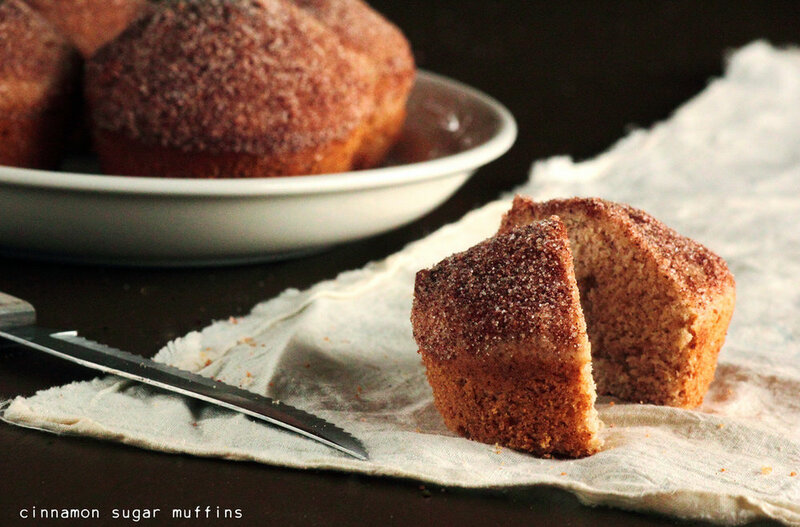 These Cinnamon Sugar Muffins are sweet and addictive. The muffins, straight from the oven, are not terribly sweet but they have a fantastic spiced flavor due to a hint of nutmeg and cinnamon. After cooling slightly, the muffin tops are dipped into melted butter and coated with cinnamon sugar. I love these plain, with no spreads or additives. Warm from the oven, these may very well be a small piece of heaven. Preheat oven to 350 degrees F (180 degrees C). Lightly grease a muffin pan or line with baking cups. In a large mixing bowl, cream together 1/3 cup butter and sugar. Mix in the egg and vanilla extract. Stir in the flours, baking powder, salt, ground cinnamon, and ground nutmeg. Stir in the milk and mix until well blended. Fill baking cup 2/3 full with muffin batter and bake for 18-22 minutes, or until a toothpick inserted into the center comes out clean. Allow muffins to cool in pan for 5 minutes before removing. Whisk together cinnamon and sugar for the topping into a small bowl wide enough to fit a cupcake. Dip the top of each muffin into the melted butter and coat with cinnamon sugar mixture. Set upright on a cooling rack to set. These muffins are best eaten the day they are made. Serve warm or room temperature.